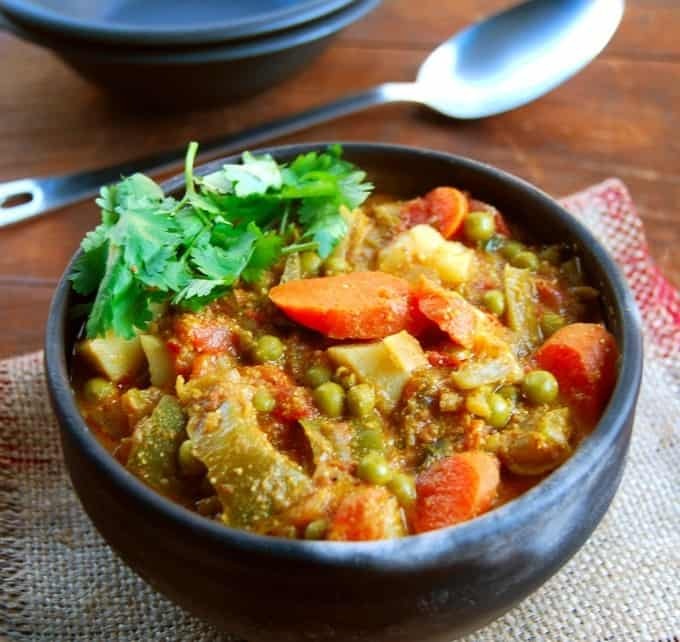 A delicious recipe for Vegetable Korma, a mixed vegetable curry packed with carrots, peas, potatoes, tomatoes, and bell peppers, in a creamy sauce of coconut, cumin, and turmeric. 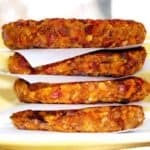 Vegan, soy-free, gluten-free and nut-free recipe. My cat Pie does not want me to write this post for you. No, really, I am not kidding. In the time that I put down these first few words for my Vegetable Korma post, she has prised my fingers off the keyboard with her little head at least a half dozen times, insisting that I attend to the far more important job of scratching the top of her head. So I did, and now I am back, and she is sitting right next to me purring. And I can bet you that before I reach the end of this paragraph she will be back for more. She’s been doing this so often of late that I found myself telling Desi the other day how much she has started to remind me of my grandmother. Not that my grandmother, Amma, wanted her head rubbed, bless her heart, but I remember how much she loved it when we gave her our undivided attention so she could tell us all about the wonderful life she had lived in her 70-plus years. 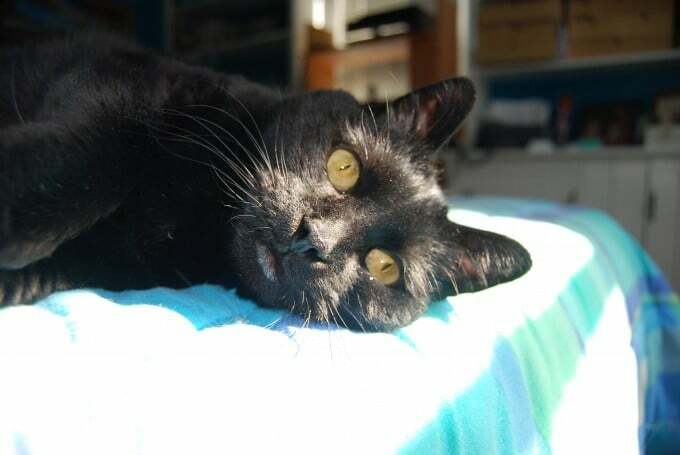 Pie is nearly 17 now — middle-aged, I like to think, because hasn’t the oldest cat ever lived to be 38 years old, according to the Guinness Book of World Records? But no matter how much I try to convince her of that, she has decided she’s a grand old lady. And like a grand old lady, she wants the entire household to be at her beck and call every moment of every day, thank you. Not that I remember a time when we weren’t at her beck and call. Oh, those cats! Coming back to the Vegetable Korma, I was trying to think up a healthy recipe packed with a rainbow of vegetables that we could scoop up with some Phulkas. A kurma, sometimes called a kuruma or kurma, is made with vegetables and you can find many versions of it in different parts of India. 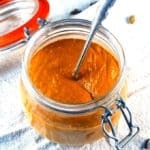 A richer version that I love is Navratan Kurma — richer because it incorporates dry fruits and nuts– but this time I was looking for something healthier and less complicated. I found this exquisitely easy recipe from the Vah Chef that I tweaked only slightly. I also added more vegetables, because I like my Vegetable Korma as veggieful as possible. There are carrots here and green peas and bell peppers and green beans. 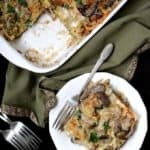 You can change up the veggies, if you like– cauliflower is wonderful in kurmas, and zucchini and mushrooms and sweet potatoes would be good too. 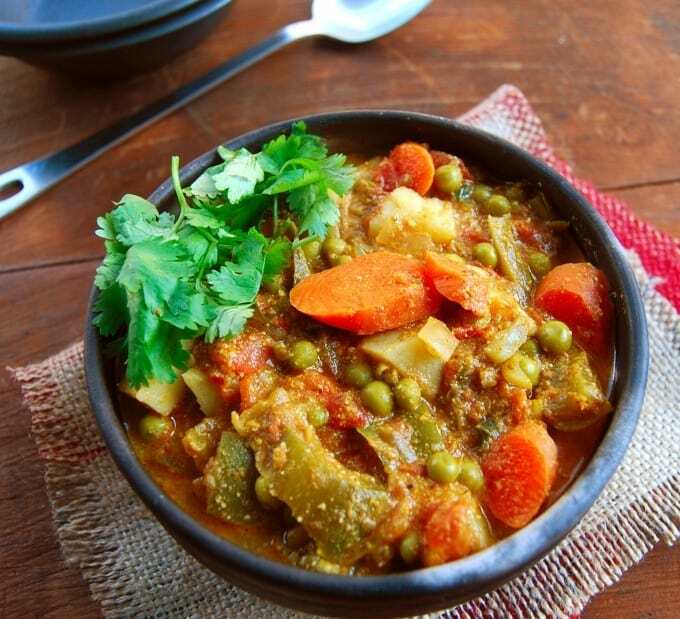 Vegetable Korma is great with Indian flatbreads, but you can also serve it with some rice and dal for a delicious meal. Uh-oh, Pie’s looking at me rather purposefully and I think you know what’s next. Here she comes! Gotta run, all, to scratch a handsome little head. 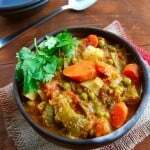 But first here’s the Vegetable Korma recipe. 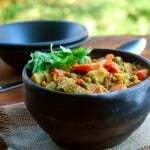 A delicious recipe for Vegetable Korma packed with mixed veggies like carrots, peas, potatoes, tomatoes, and bell peppers, in a creamy sauce of coconut, cumin, and turmeric. 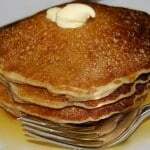 Vegan, soy-free, gluten-free and nut-free recipes. Place the beans, carrots and potatoes in a microwave-safe bowl and zap for seven minutes on high or until the potatoes are tender but not mushy. Place the coconut milk and poppy seeds in a blender and blend until you have a smooth paste. Add a little bit of water if needed. In a pressure cooker or in a large saucepan, heat 1 tsp of oil. Add the onions, stir and cook for about a minute or two, then add the tomatoes, ginger-garlic paste, cayenne, turmeric, coriander powder, cumin powder, and a generous pinch of salt. Stir everything together and then pressure cook for about 10 minutes after the cooker reaches cooking pressure. 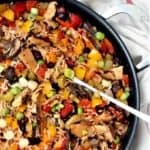 If you don't have a pressure cooker, place a lid on the saucepan and cook for about 20 minutes over medium heat, stirring frequently, until the onions and tomatoes are really well-incorporated. In another saucepan, heat the remaining 1 tsp of oil. Add the curry leaves and then add the coconut-poppy paste. Stir frequently and cook until the paste becomes a couple of shades darker. Don't walk away at this stage because the paste can easily burn. Add the diced bell pepper and peas and stir well. Add the cooked vegetables and the tomato-onion paste. Stir everything well to mix, add water if you want a thinner curry, bring the mixture to a boil, slap on a lid, lower heat to a simmer, and cook about five minutes for all the flavors to meld. Add the garam masala and more salt. Stir in the coriander leaves. Serve hot. 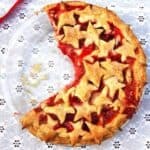 Aaaw… look at Pie, so innocent! 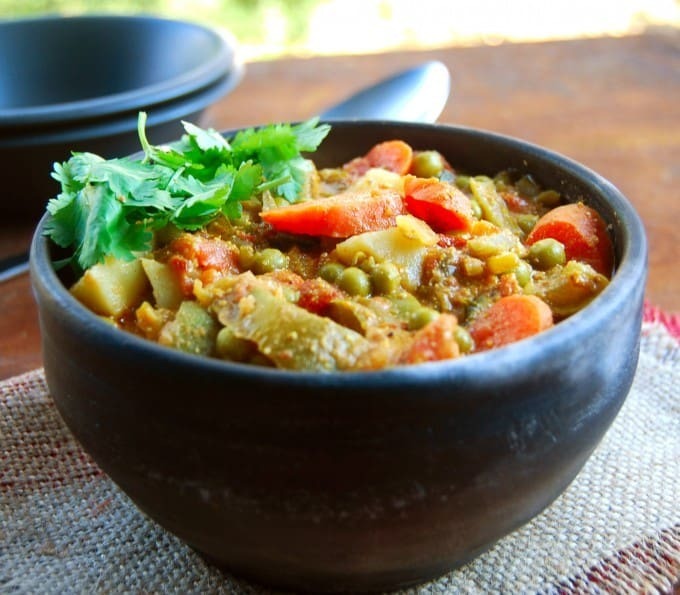 I can imagine scooping this tasty kurma with a poori, yum! VahChef has good recipes and I am making this. I like the fact that it uses coconut milk ( my family is not in favor of using shredded coconut and having bits of it floating in the gravy). Pallavi, thanks, and this is fab with pooris. I do love Vahchef– his recipes are almost always on the spot. Thanks, Veenashankar! A happy new year to you. Getting compliments from my family for this great dish.. Followed every step, and it has come out sooo well. 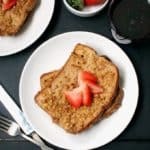 This recipe is so easy and quick and healthy. The kurma came out really good and my kids loved it too! 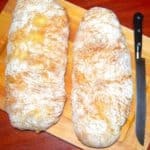 I am really enjoying trying out your recipes! Btw, your photos are great and I love to hear about all your cute little furry friends! Sunitha, so glad you liked it — thank you for letting me know! 🙂 And I will be sure to pass on your compliment on the photos to Desi. Pie is a beautiful lady! I have a black kitty who looks a lot like her, but my Martha is “only” 15. Your kurma looks pretty darn good, too. If I had time to stop and buy potatoes on the way home tonight, this would be what’s for dinner. 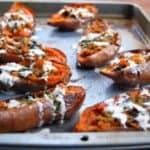 Thanks for sharing your recipes and photos. Thank you so much for this recipe! It came out wonderfully! It is the first time I have successfully managed to make an Indian dish. I could never get it right before. This recipe was easy to follow and tasted authentic. Can’t wait to try more of your recipes! Use a nut milk, like cashew. You can make it yourself.